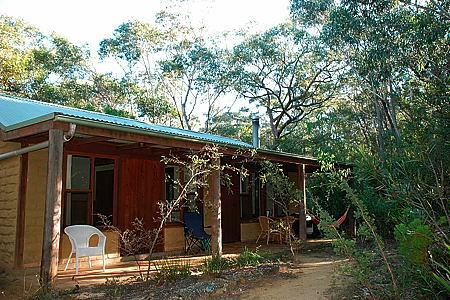 Bunjaree Cottages: Four eco-friendly, pet-friendly holiday cottages set in secluded Blue Mountains bushland, offering a delightful getaway for couples, families and small groups. Minutes from bushwalks and cafes, seconds from bushland and more than 50 species of birds! Check the post list on the right for our April School Holiday Special! ‘Wenty’ village just a few minutes away for some of the best coffee and cakes you’ve ever tasted. Bunjaree offers four delightful eco-friendly cottages: Wattle and Tea Tree Cottages for couples, Banksia and Waratah Cottages for small groups and families. All cottages are fully self-contained, with good kitchens, have wood fires for winter, verandahs for summer, and come with quality linen and the special character of homes that are well-loved and cared for. We can also cater for special requests, including pick-up at Wentworth Falls Station during school holidays, to pre-stocking your kitchen from the local supermarkets. Contact us with your requirements.